You are currently browsing the tag archive for the ‘track’ tag. 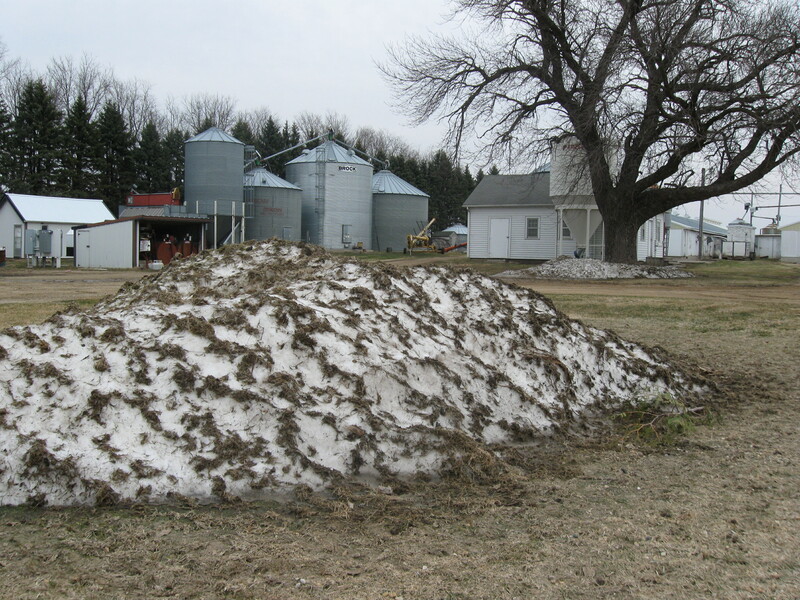 Although sites like this snowpile in our yard indicate that winter has not completely left, the signs of spring are here. The robins are back and you can hear birds chirping in the morning. The temperatures are warmer and the spring winds are blowing. I have an urge to clean my kids closets. Track season is underway for the boys. The past 2 Saturday’s they have had an indoor meet at MSU in Mankato. This Thursday they will have their first outdoor meet in St. James. Brett has run in the 4 x 800 relay , the 3200 m. run and triple jump. Adam has done the 1600 m. run. The events may change depending on the needs of the team, but they will generally do longer distances. With Dale’s help and encouragement I’ve run some longer distances outside. Increased exercise through the winter months has given me a better base to train from. Spring is a time of new beginnings. After the cold, quiet winter, plants and animals (and people) come to life. We have a new found energy that makes us want to do things, especially outside. “I’m not afraid to”. Those were the words my 13 year old son Adam said to Dale, before he stepped to the line for his 800 meter race. Just a little while earlier, he had finished the 1600m run, with a personal best of 5:50. Dale had encouraged him to lay it all on the line for his race and Adam responded beautifully with a 2:40 time and first place. If you recall my earlier blog, this is a busy track week for us. Adam has branched out by running a leg in the 4×100, 4×200 and the 800 m run. Brett ran the 1600 m with a 5:35 time and continued to improve in the 3200 m run. They aren’t winning the races, but they are improving their times, gaining confidence in their abilities. Go back and read Monica and Maddie’s blog on May 4. Maddie started her run a bit tentative, disappointed she was missing the grand march for Prom. Yet as she ran along the trail, she met people who had the same goal she did, to run at Grandma’s. You can see how her spirits are lifted. Her excitement grows with the new circle of friends she meets, each with the same goal, to compete at Grandma’s. It’s not about being the best. Very few of us will ever “be the best”. It’s about having the courage to challenge yourself and the discipline to succeed. This week we have 4 track meets on 4 separate nights. Next week it’s 3 track meets on 3 different nights. With such a busy schedule, preparing and eating a nice sit-down meal is just not possible. Plus, we live 10 miles from the nearest grocery store and any type of convenience store, so “take out” food is not a good option. The kids can only eat so much frozen pizza and macaroni and cheese. They will even roll their eyes with the “not again” look when we’ve had too many peanut butter and jelly sandwiches. One thing that works well for our family is pulled pork. Slow cooking a shoulder roast until it’s fork tender creates a meat that works well in a bun, between a flour tortilla or even on a salad. It’s a quick meal without all the disadvantages of typical fast food. We roast a large quantity of pork at one time and then freeze it in small packages. This allows us to pull out a package from the freezer and have a nutritious meal in only a few minutes. Another thing I try to do is to prepare a good meal on a day when I have time and then have leftovers for another day. Sunday I doubled my recipe for meatloaf and actually prepared it on the grill. I formed a loaf, put it on an aluminum foil covered flat baking sheet and then put it on the grill for about an hour. We had meatloaf for supper and enough left over for sandwiches or a quick meal. Sometimes life moves pretty fast and taking time for a relaxed meal around the table isn’t an option. But fast food doesn’t need to be filled with empty calories. With a little planning, pork can be the answer to a fast, flavorful and nutritious meal. Ever had a task you knew you needed to do, but it still overwhelmed you? If you recall, I’ve been increasing my running mileage to get closer to a 5K. But the time had come when I knew I needed to run the 3.1 miles, to break through my barrier. Fortunately the other day Dale’s training called for an easy workout; a perfect opportunity for us to run together. When the time came, I’d been busy with other tasks, plus the wind was blowing; again. It would have been easy to postpone the run, but I knew I wouldn’t be happy with myself. I admitted my nervousness to Dale as we started out down the road. Well, 3.1 miles later I had completed a great run, filled with confidence, knowing I’d overcome my fears. My son Adam is experiencing the same situation as he faces the possibility of running the 4×100 relay for an upcoming track meet. When I asked him about his apprehension, it had to do with never having run that short of distance. He isn’t confident that’s he’s fast enough. Time will tell how things turn out. What don’t we do because we are afraid? How do we teach our kids to face up to their fears and apprehensions and to help them understand that in the end, they will be a better person for doing so? You gain strength, courage and confidence by every experience in which you really stop to look fear in the face. You must do the thing, which you think you cannot do.